Cruising boaters already know the benefits of diesels: torque, fuel economy, safer fuel and long-term reliability. But trailer-boaters – typically more familiar with gasoline engines – are another matter. A few days with GMC’s new Canyon Diesel pickup truck might bring them around. The Canyon Diesel is a mid-sized truck, but big on pulling power, comfort and fuel economy as a daily driving vehicle. Towing was top-of-mind for the designers, so trailering equipment is part of the plan, not an after-thought. The 2.8 L Duramax Turbo Diesel under the hood of my test truck added $4,390, pushing the price tag to $49,940. But the diesel helps the mid-sized Crew Cab SLT 4WD truck deliver a 7,600-lb (3,447-kg) towing capacity. Also, there’s an exhaust-brake that promises to improve handling with and without trailers. The Canyon is less massive than most of today’s full-size pickup trucks, making it a more friendly vehicle for daily use. It’s easier to park and more comfortable negotiating crowded city parking lots and narrow back-roads. The Canyon also looks big, with 18-inch wheels, flared fenders and a pumped-up hood – complete with Duramax chrome nameplates. The turbocharged diesel gives it the kind of performance that matches that appearance. On paper, the inline four-cylinder appears a tad weak, with a 181-hp rating compared to the standard 200-hp four-cylinder 2.5 L gasoline engine and the 305-hp V-6, but the diesel easily out-muscles both gasoline engines in the torque department, putting out 369 lbs-ft across a broad torque-band. That’s what you need on the launch ramp and what you feel accelerating from a stop, with or without a trailer. What you don’t feel or hear is the rattle, roll and roar usually experienced with big diesels, thanks largely to a damper system in the six-speed transmission’s torque converter that uses springs to cancel out engine vibration. Mashing the accelerator brings a bit of a diesel growl, but none of the annoying rattling noise sticks around. If you are driving the Canyon Diesel in very cold conditions, below -20 C, icing may be a potential problem in the air intake. Your dealer can suggest solutions. 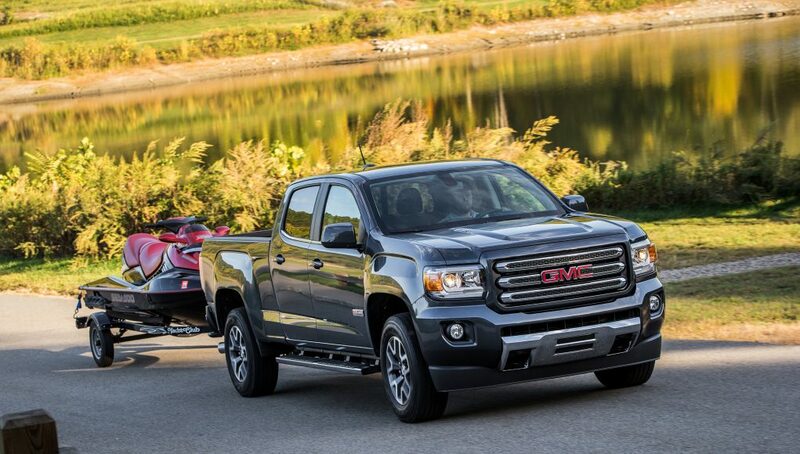 In the conditions you will encounter during boating season, the truck has great potential. Signaling the Canyon Diesel’s appeal to trailer-boaters specifically, GMC delivers all diesel models with a standard trailer package, including a hitch receiver, seven-pin trailer wiring connector, an automatic locking rear differential and 3.42 rear axle, along with an integrated trailer brake controller. The SLT model test truck is comfortable and well trimmed, with leather seats, heated in the front. The rear seats have plenty of legroom and a pull-down middle armrest. The five-foot two-inch bed is well equipped with tie-downs. The test truck had a raft of options like upgraded audio and navigation, but bragging rights as the most fuel-efficient truck on the market come standard. In 2WD, highway mileage is at least 7.7 L/100 km (or 37 miles per gallon); I did even better. In 4WD mode, the published fuel consumption is 8.2 L/100 km (34 mpg) on the highway, with a combined city-highway rating of 10.3 L/km (27 mpg). Comfort, good looks, diesel capability and lowest truck fuel consumption: they all conspire to make the Canyon a very desirable tow vehicle.